Looking west from the town toward the armamaents factory buildings. The Lockyer Creek bridge is an example of the early use of reinforced concrete in bridge building in Australia. It was only 10 years earlier, that a bridge of significant size using this technique was built in France. 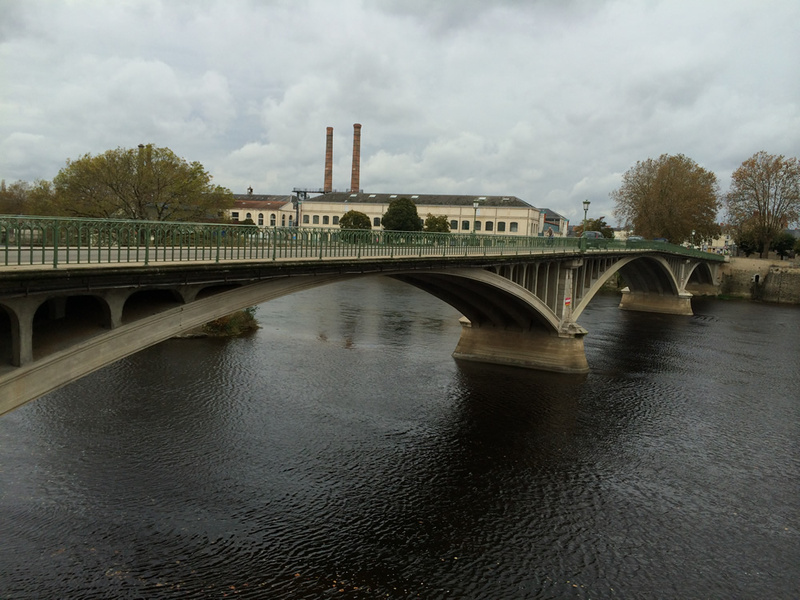 The Camille de Hogues bridge (named for a town mayor) was built in 1899, over the Vienne River in Chatellerault. This road bridge had a strategic purpose - to join the commercial part of town to the armament works on the west side of the river. Another multi-arched stone bridge 500 metres to the north, was built around 1600. Like the Camille de Hogues bridge, it is now classed as a National Monument. I visited both bridges in 2014, the area being only 3/4 hour south of Tours in the Loire valley. Unlike the Lockyer Creek bridge, with its separated spandrel arches, these 3 arches are constructed in a solid section, with vertical pillars supporting the deck.